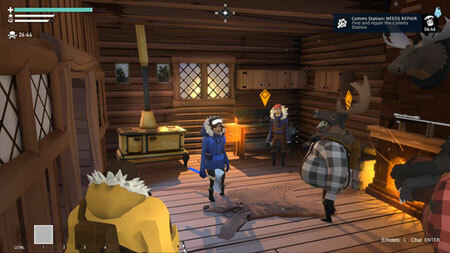 Project Winter is an 8 person multiplayer game from Other Ocean Interactive, focusing on social deception and survival. Communication and teamwork is essential to the survivors’ ultimate goal of escape. Gather resources, repair structures, and brave the wilderness together. There are traitors within the group who will be steadily gaining strength as the match progresses. Traitors’ only goal is to stop the survivors by any means necessary. The traitors are known to each other but not the survivors. Their goal is to stop the survivors from escaping without being identified and killed. As a survivor amongst a group of strangers you will have to collect resources, battle the elements and complete a series of tasks in order to call in one of several rescue vehicles. Survivors cannot escape unless they work together. Players who wander off on their own will have difficulty surviving the elements, can fall victim to hostile wildlife, or become easy targets for the traitors. There are several ways to communicate with other players, including proximity-based voice chat, private voice chat radio channels, text chat, and emotes. Communication is key if the survivors have any hope of completing their tasks and defending against the traitors. If you get stuck in the game, check out the video walkthrough and gameplay for the game. This entry was posted in PC Games, Walkthrough and tagged Project Winter Cheats, Project Winter Gameplay, Project Winter Guide, Project Winter Strategy, Project Winter Walkthrough by Marvin. Bookmark the permalink.